(Nanowerk Spotlight) Until more information becomes available on the mechanisms underlying nanomaterial toxicity, it is uncertain what measurement technique should be used to monitor exposures in the workplace. Current research indicates that mass and bulk chemistry may be less important than particle size and shape, surface area, and surface chemistry (or activity) for some nanostructured materials. Many of the sampling techniques that are available for measuring airborne nano aerosols vary in complexity but can provide useful information for evaluating occupational exposures with respect to particle size, mass, surface area, number concentration, and composition. Unfortunately, relatively few of these techniques are readily applicable to routine exposure monitoring. NIOSH, the National Institute for Occupational Safety and Health in the United States, has initiated exposure assessment studies in workplaces that manufacture or use engineered nanoparticles (see "Approaches to safe nanotechnology"). Strategies recommended by NIOSH to assess exposures rely on sampling with respirable samplers followed by analysis with electron microscopy for particle sizing (e.g., "Occupational Exposure to Titanium Dioxide"; pdf). However, "Particle sizing by electron microscopy is difficult, not well defined, and expensive (~$300)" Thomas M. Peters, an Associate Professor of Industrial Hygiene Occupational & Environmental Health at the University of Iowa, tells Nanowerk. Reporting their work in a recent issue of Environmental Science & Technology ("A Personal Nanoparticle Respiratory Deposition (NRD) Sampler"), the team describes a unique new sampler design that collects nanoparticles separately from larger particles in a way that mimics the respiratory system. "We have developed a new sampler that collects nanoparticles separately from larger particles in a way that mimics their deposition in the respiratory system" explains Peters. "By capturing only nanoparticles on the sampling media, cost-efficient bulk analysis techniques (e.g., inductively coupled plasma mass spectrometry) could then be used to estimate the amount of deposited nanomaterials without the need for electron microscopy. For TiO2, we anticipate that the cost per sample will be about $30." Central to their new sampling device is a new sampling criterion for nanoparticles – the nano-particulate matter criterion (NPM). This criterion is analogous to other sampling criteria (i.e., respirable, thoracic, and inhalable) in that it ties sampler performance with respiratory deposition. "In the 1990s, I was involved with development of regulations and samplers for environmental use – particulate matter smaller than 2.5 µm" says Peters. "This experience provided the perspective that new sampling criterion are sometimes needed before new samplers are developed." Peters notes that, "rather than attempting to collect nanoparticles with 100% efficiency, the team's sampler was designed to collect nanoparticles with efficiency matching how they deposit in the respiratory tract to provide a physiologic relevance to sampler's performance. The NPM provides the target collection efficiency, by particle size, for the sampler." "That means that our NRD sampler is fundamentally different from commonly used samplers – e.g., respirable and inhalable samplers – that are based on penetration of particles to different regions of the respiratory system" says Peters. "It also provides a streamlined way to conduct quantitative, routine exposure assessment for metallic nanoparticles." The lightweight (∼60g) NRD sampler consists of three primary components assembled in series: a 25 mm respirable aluminum cyclone, an impaction stage and a diffusion stage. 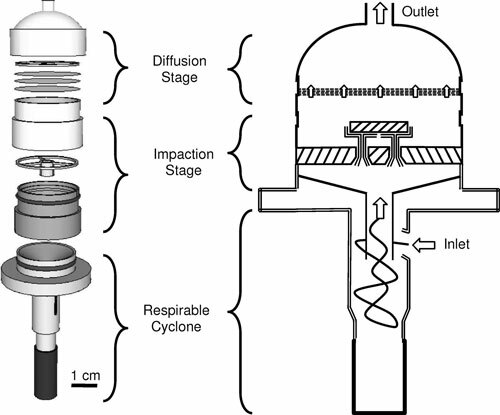 Peters explains the samplers function: "Air is drawn through the cyclone, which removes particles larger than the respirable sampler criterion and transports the respirable fraction to the impaction stage, where particles larger than 300 nm are removed. In the diffusion stage, the remaining airborne nanoparticles diffuse to and are collected onto nylon mesh screens with an efficiency closely matching the NPM sampling criterion." He points out that, with chemical analysis of the diffusion media, the NRD sampler can be used to directly assess exposures to nanoparticles of a specific composition apart from other airborne particles. The immediate application is for sampling of metal-based nanoparticles in the workplace. The team are already working on the analytical technique for titanium dioxide and other metals. Other analytical techniques will be explored in future research to broaden the applicability. "We plan to develop the sampler further to enable greater airflow rates for lower detection limits" says Peters. "We also plan to deploy the sampler in field tests".